ANC chairperson Baleka Mbete and AU Chair Nkosazana Dlamini Zuma. The announcement of Nkosazana Dlamini-Zuma as the preferred candidate for the presidency of the ANC by the women’s league has apparently caused divisions. Some members of women’s league do not want Dlamini-Zuma as president of the governing party. According to a report in the Mail and Guardian, the league backed the nomination of a woman but had opted to debate the actual candidate at a later stage. 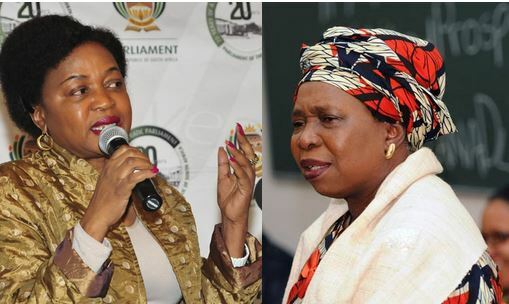 Bathabile Dlamini, who is seen as a staunch supporter of President Jacob Zuma, who has indirectly endorsed his ex-wife, is understood to have lobbied for Dlamini-Zuma to become the league’s official candidate. This despite Zuma telling Baleka Mbete, chairperson of the ANC, that she would take over from him. Mbete had readied herself for the transition of power, even sharing this with her family and community members in the Eastern Cape last year. The swift change of candidacy has angered several members of the league, who contest that this was not their choice, and it was forced upon them by Bathabile. Other capable candidates who have been touted include Lindiwe Sisulu, the minister of human settlements, and Nosiviwe Mapisa Nqakula, who heads the defence ministry. “The truth of the matter is there is a decision that there is a specific time that will come when officially the debate is opened up. And of course they took us all by surprise, but it has happened,” said Mbete. Mail and Guardian further reports Mbete no longer enjoyed a cordial relationship with Zuma, as she was upset over him sidelining her to endorse his ex-wife. Zuma recently said in an interview with a radio station that the ANC was ready for a woman president and he believed the proposed candidate would be more than capable. Mbete said it was untrue she harboured any ill feelings, explaining that views were expressed and life goes on. “Even in the last few days, a lot has been going on, and that continues. So the fact that certain viewpoints have been expressed, it’s fine,” she added. Mbete also said should other party structures put her forward to succeed Zuma, she would avail herself.